We just returned from our year end vacation, and no prizes for guessing where we ended at! For the second time in 2015, we visited Taiwan, and I can shout out loud that I love that country very much. With the vast open spaces and lush greenery, as well as the almost endless coastal scenery, I cannot get enough of Taiwan. There's still so much for us to explore and I am very sure we will be back there very soon. This time, we went southwards flying into Kaohsiung instead of Taipei. For the uninitiated, Kaohsiung is at the south-western part of Taiwan, very close to the southern tip, and it is the second most populous city after Taipei. In the past, the only direct flight from Singapore to Kaohsiung is on China Airlines. Most recently, our local budget carrier Scoot started flying this route, and we love it because it takes almost an hour less if we flew into Taipei. Best for my J who hates long plane rides. 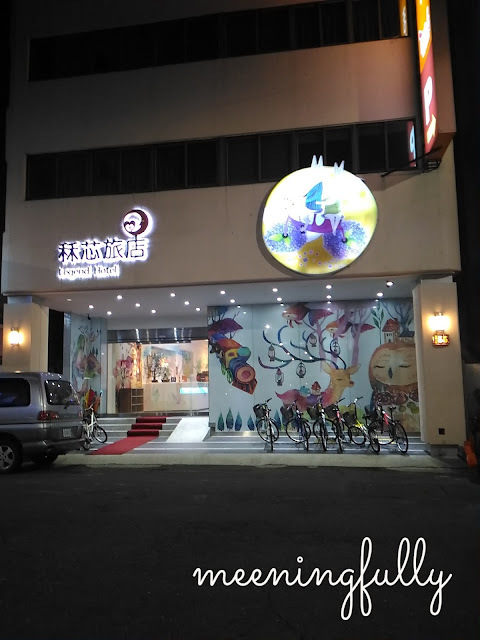 Legend Hotel is conveniently located between the famous Formosa Boulevard MRT station and the City Council station. And, for night market lovers, Liuhe Night Market is just 5 minutes walk away. A 3 star hotel, with a 4 or more star service. The bicycles outside the hotel are for guests to rent and explore on wheels. From the entrance to all that you see inside, what impressed me is all the hand painted murals, super cute ones no less. What do you think this train is used for? It is a luggage storage! How innovative right? Coffee and tea making facilities, with magazines to read at the little R&R corner. X-box at the lobby to entertain. The impressive murals along the corridors. Apparently, each floor has a different theme. The bright and cheery decor is definitely a draw for young kids. The murals continue into the rooms. The super big bed. Enough space, even larger than a king size for a family of 3. Complimentary drinks and snacks in case you get peckish at night. In fact, there's 7-eleven just around the corner , so fear not for hungry guests. An environmentally friendly way to deodorize the room. The bathroom is enough to pack in a tub! Just what we needed to entertain the kid. A simple breakfast spread at the basement, with a small selection of taiwanese stuff such as porridge and also pastries for those who prefer something for western. We had a very comfortable stay at Legend Hotel. While not situated at the central shopping area of Sanduo, it is just a short taxi ride away. And, of course, everything is accessible by the MRT. There are also a lot of interesting eateries lining the streets where the hotel is, and if all else fails, there's always the rows if seafood at Liuhe Night Market. The hotel provides many services that includes a shuttle to the nearest MRT station. Apparently, I overheard, they will also help arrange for bus pick-ups to Kenting. For those who need freshly laundered clothes during your stay, there's a laundry room at level 9 of the building. Best of it all, the hotel rates are very reasonable. We paid less than S$100 a night! So, if you are every thinking of a direct flight from Singapore to Kaohsiung on Scoot, why not consider Legend. Definitely a value for money option!